The Lower Modernisms – 040. 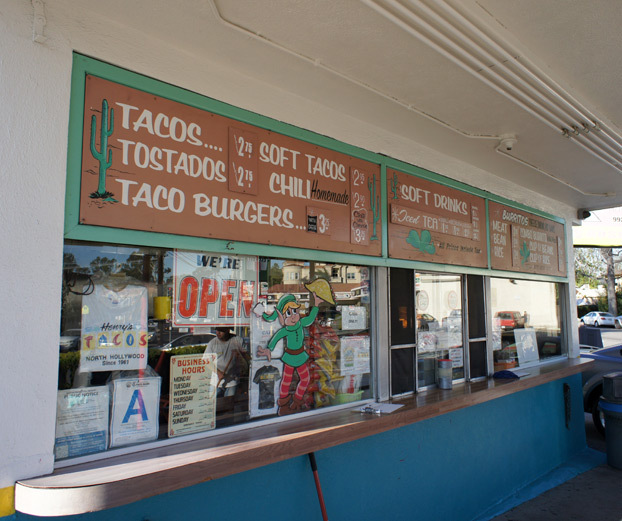 Lomo Featured Project: Henry’s Tacos, Studio City. Endangered Lomo. January 29, 2012 by James Black. 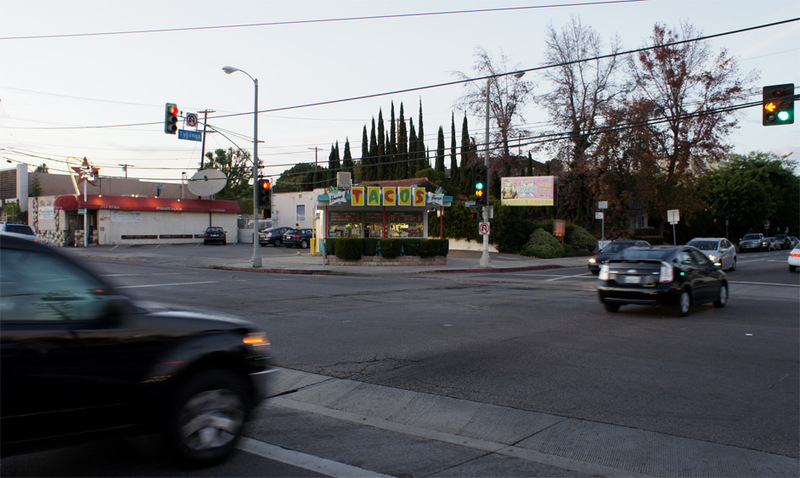 Standing at the corner of Tujunga Avenue and Moorpark Street in Studio City/North Hollywood since 1961, Henry’s Tacos is a taco stand in the literal sense of the term – you conduct your transaction standing at a window. The tacos are “gringo” style. The crunchy taco shells are fried prior to filling, like the ones you might make at home on taco night, and contain seasoned ground beef, shredded cheddar, lettuce and tomato. 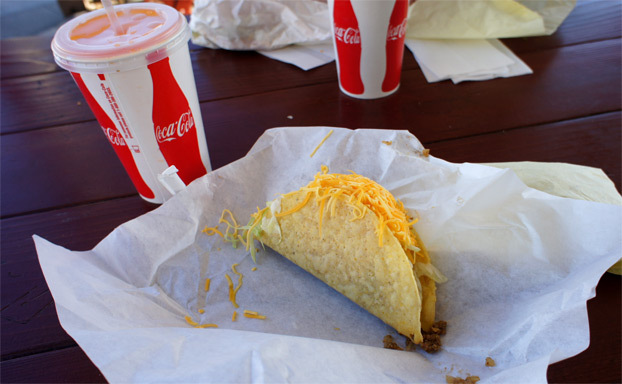 The quality of ingredients compares favorably to Taco Bell, but they also cost a lot more at $2.75 each. 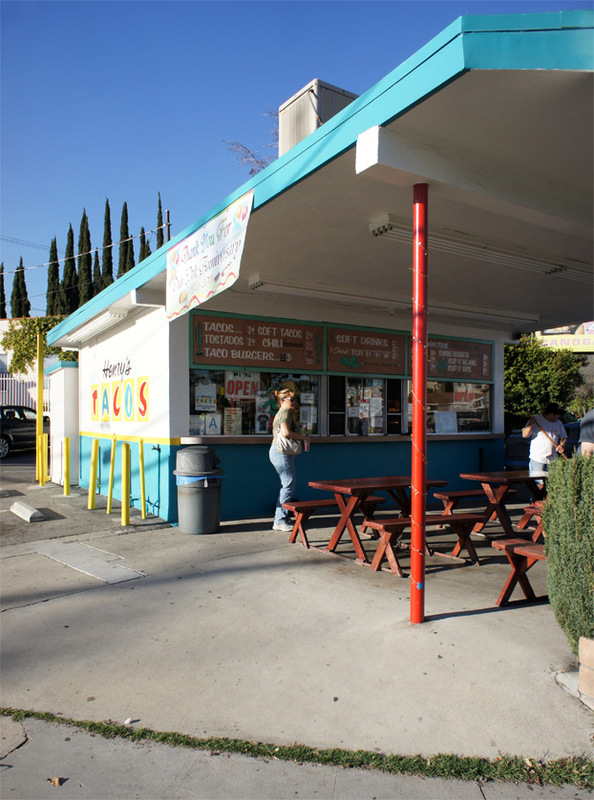 This modest taco stand comprises a tiny 280 square feet according to city records. Its diagram is pure and imageable – a flat roof, half of which has walls under it enclosing a kitchen, and the other half of which is held up only by posts to shelter a few outdoor tables. Its position on the site is unorthodox and surprisingly urbane, boldly exposed to the street corner as if it believed in the possibility of pedestrian life. Its bright primary colors and jaunty, Googie graphics give it the festive feel of Mid-Century amusement architectures. Henry’s has been in the news lately, owing to its endangered status. The owner of Henry’s has supported its application to be named a city Historic-Cultural Monument, and improbably enough, the Cultural Heritage Commission just issued a unanimous recommendation to the City Council that it be approved. The owner of the parcel on which Henry’s is built, however, opposed the Monument status, presumably because it would make the land less marketable for other uses by inhibiting redevelopment. Henry’s stands on a 6000-square-foot parcel, which includes the parking lot as well as the adjacent Starlight Room. This is still a small parcel, but is zoned for commercial development, and there could be something built here that would earn more rent than this little taco stand. 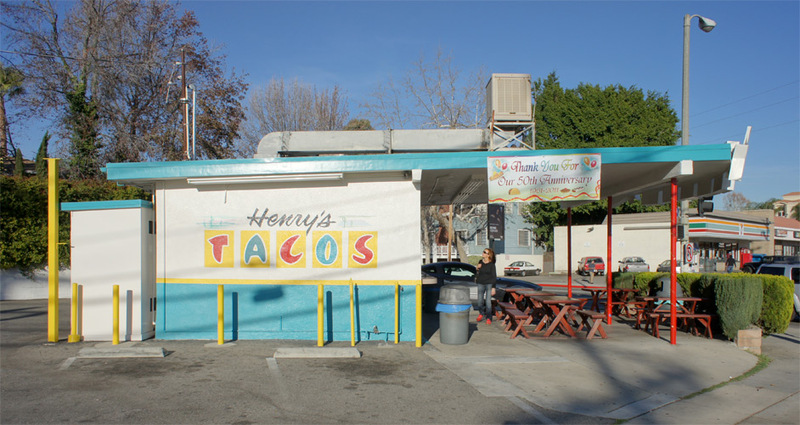 This feud has been the public backdrop for sour negotiations about extending Henry’s Tacos’ lease on the property – its long-term lease expired, Henry’s is threatened with the prospect of eviction at any time; and Historic-Cultural Monument status is no guarantee against demolition, either. We anxiously await news of Henry’s status. 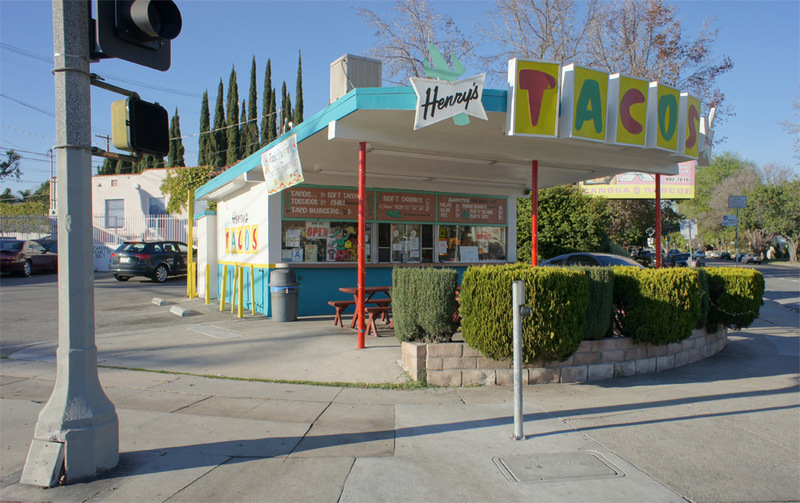 I have not seen the Historic-Cultural Monument application, but I presume it asserts the value of Henry’s Googie-style architecture, as well as its importance as a rare surviving example of an early taco stand. The former point is debatable – its strongest Googie feature is its signage, but the signage is awesome. The “Henry’s” in script over a four-pointed starburst over a stylized cactus contrasts with “TACOS” in red and blue on individual yellow lightbox rectangles – it is astounding that this archetypal look is authentic, and not retro or self-referential. If Henry’s achieves Monument status, it would be a remarkable precedent. I would start sending in HCM applications all the time for any old thing – there are so many fine specimens of Endangered Lomo out there that it is already a struggle to prevent The Lower Modernisms from devolving into a full-time preservationist organ. So we say, Go, Henry’s! Show your support of the continued existence of this worthy stalwart by eating tacos. And sign the petition. Thanks, Carren! I applaud your choice of taco stands to live next door to.